On our driving tour of the Grand Loop, we decided to take a late morning brunch at Roosevelt Lodge upon reaching the Eastern half of Yellowstone National Park. Teddy Roosevelt favored the Roosevelt-Tower area above all other places in Yellowstone Park for its abundant wildlife. 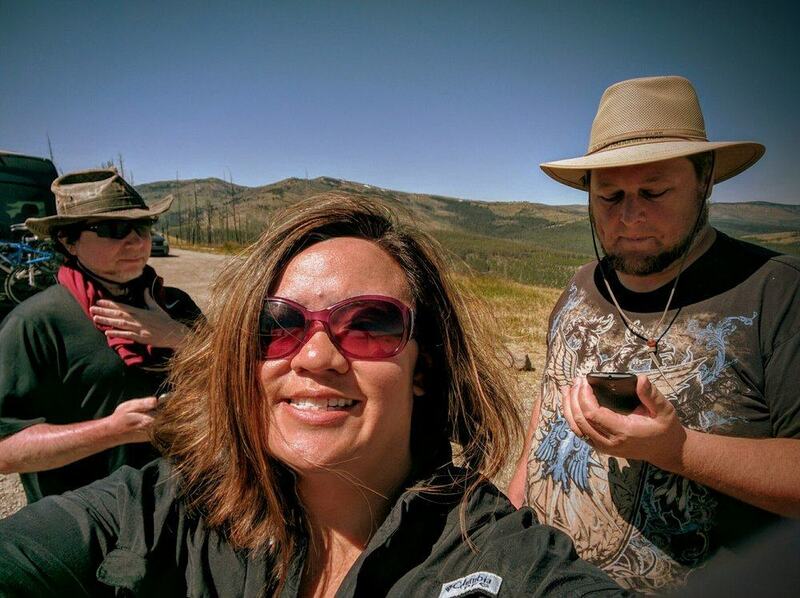 Even on Grand Loop Tour, we had to stop several times for “Bison or Elk Traffic.” Bison, deer, and elk are easily spotted along the roadside, while you’ll have to hit a summit trail to find Bighorn and goats. Bears frequent backcountry trails, so arm yourselves with bear bells and bear spray. Elusive wolves are trickier and due to regulations, you’re not allowed to approach them or their dens. If you want to see a wild wolf, get a high powered telescope or binoculars and ask the backcountry ranger office for where, when, and how to view them. Long before the park and the lodge itself Native Americans, trappers and explorers camped in the area. Later in 1906, Wylie Permanent Camping Company built a semi-permanent tent camp, calling it “Camp Roosevelt” and served visitors arriving on the Union Pacific railhead from the nearby town. Although President Roosevelt never stayed here, many a rich clientele did. A pamphlet from 1908 details five and six-day tours costing as much as $40.00. They had tents that could hold as many as four people and were available with board floors and rugs. Every tent had a wood stove, beds with fine mattresses, and “good clean sheets, blankets, quilts, etc.” In the evening, guests could enjoy the posh dining tent complete with white cloth service. In addition to providing a base for fishing parties and saddle-horse trips, Camp Roosevelt dutifully served as a field laboratory where teachers and their students could conduct research. Park officials also used the camp as a base to present lectures and conduct daily field trips for the collection of botanical specimens for the park museum. Scientists based at the camp also conducted wildlife studies on the park’s native animals. 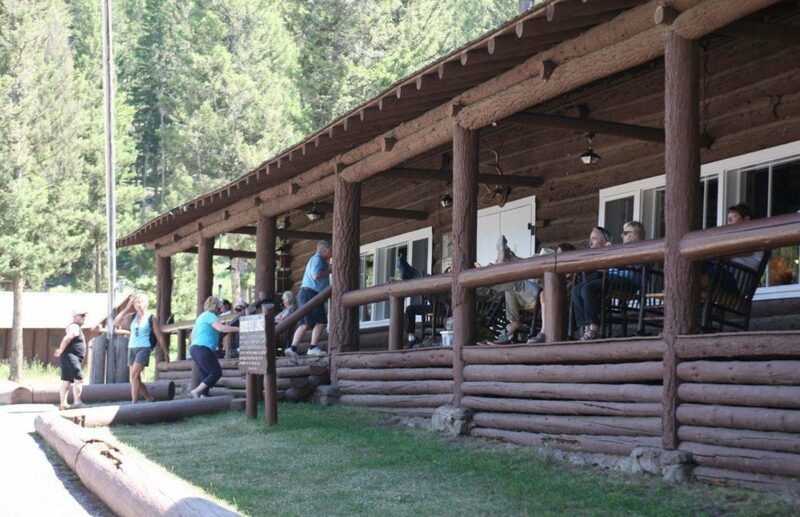 Built in 1919-1920, the L-shaped one-story log building provides a communal meeting space and dining facility for visitors and staff. The larger spaces feature exposed log roof beams set into a lowered ceiling. In 1920, park officials completed a lodge constructed of unpeeled tree logs, and a few years later, 43 small log cabins. Officially renamed Roosevelt Lodge, it came complete with a dining room, lobby, registration desk, and a wide porch lined with rocking chairs. The lodge building remains the same today: old Hickory rocking chairs fully occupied on the porch by tourists, an open dining area serving locally sourced foods, and a welcoming stone fireplace now converted to gas fuel. 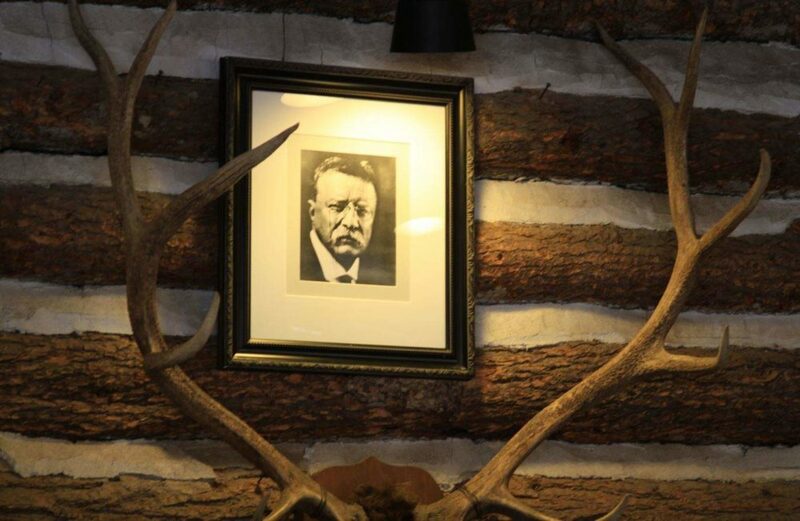 There even sits an original photograph of Theodore Roosevelt on the lobby wall, even though Roosevelt himself never came to stay at the lodge during his lifetime. 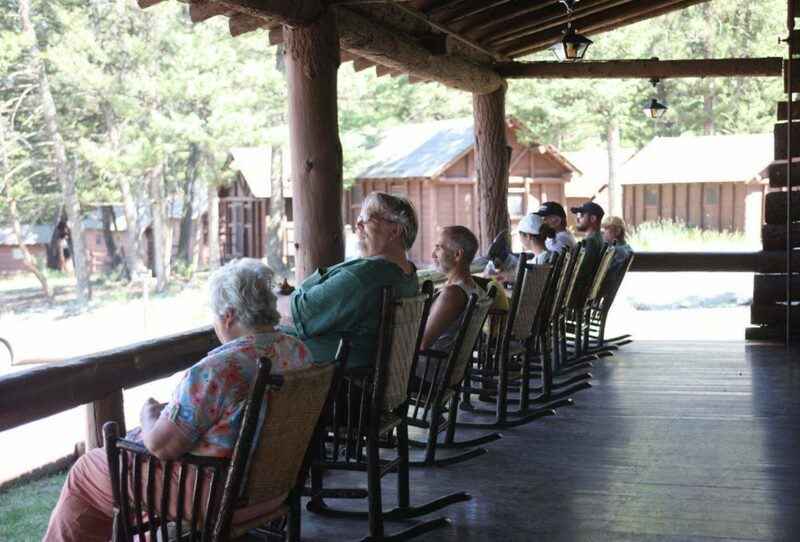 Watch the sunset lodge porch while in a rocking chair. When Hitch and I visited, we discovered a lot of foreigners staying here, mostly German-speaking tourists. I’m guessing they’re here for that “Old Wild Western” aesthetic. This struck me as odd because early on Yellowstone itself didn’t have very many cowboys herding cattle and the geography doesn’t lend itself to the activities most associated with the Wild West. Park officials and surrounding rangers are very good about keeping cattle out of the park. I guess using the Old West as a marketing tactic turned out to be a successful one, even long ago when railroads and stagecoaches transported tourists to the area. Today at Roosevelt Lodge, you can get tickets for wagon rides, saddle tours, and the very popular Old West Dinner Cookout trips. Sorry, Pres. Roosevelt did not stay at Roosevelt Lodge. It’s just named after him. Just a few miles south, along a quick 7-minute scenic drive, you can find Tower Fall. Following the trail will lead you to the bottom of the waterfall and a fantastic view, but be wary of the half-mile steep and switchback hike. I’ve read that during the winter, a wondrous ice dome encases the entire waterfall. The name “Tower” derived its name from the towering volcanic formations surrounding the river just above the falls. The Tower area gets quite crowded with tourists from 10 am to 3 pm, so I suggest going either before or after peak hours. About 10 miles south of Roosevelt Lodge, Chittenden Road leads to the north side of Mount Washburn Trail Head. Those who hike the trail consider it strenuous, but from an elevation of 10,243 feet, Mount Washburn offers panoramic views of about 20 to 50 miles in all directions. That kind of view is worthy of any sweat equity investment. During July, wildflowers carpet the slopes, while bighorn sheep step deftly between rocks or sun themselves on a ridge. Upon this mountain sits one of Yellowstone’s three fire lookout towers. The ranger lookout comes complete with restrooms, exhibits, and an observation deck. From the deck, you can see most of the park, including Yellowstone Lake, Grand Canyon of the Yellowstone, the Central Plateau, and the Absaroka Range. On a very clear day, you can make out the distant peaks of the Grand Tetons. Best to attack Mount Washburn Trail early morning if you want some solitary time and a chance to view wildlife. Yes, we enjoyed the Pokemon Gym at the Mt. Washburn Trailhead. About 9 miles north of Roosevelt Lodge on Grand Loop, Hitch and I found a delightful 6-mile one-way dirt road called Blacktail Plateau Drive. The drive takes you back into the woods and meadows of Blacktail Deer Plateau and provides a wonderful retreat from the paved road and experience the solitude of the Yellowstone wilderness. The rough road makes for slow driving, but the area has views and serenity worthy of the time. Visit Blacktail Plateau Drive if you want some quiet me time.